Incredibly intensive and own whisky. 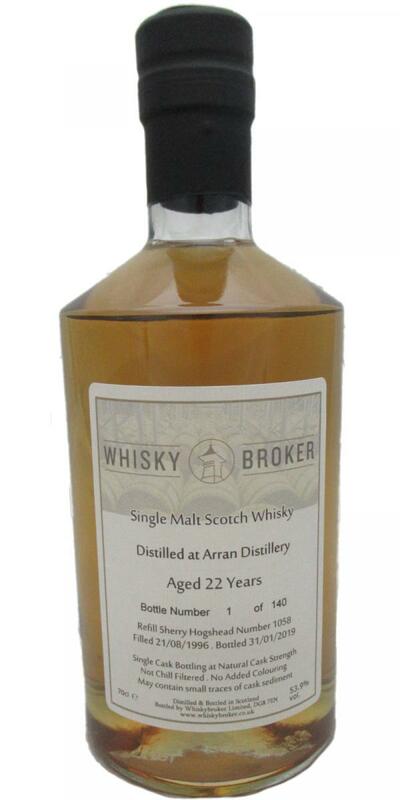 Refill Sherry is the Arran next to Bourbon anyway and then the part also has a great PLV. Fresh and fruity with lemon, tangerine and apricot. Mineral notes, fresh hay and glucose. Some wood and caramel. A hint of smoke and some white pepper. In the background are also some dark fruits and chocolate added. Fruity and sweet with a little spicy oak - great nose. Take-2 candy, really sweet with lemon and orange. Slightly tingling and really lots of wood with white pepper and pleasant bitterness. White chocolate and some caramel. Violent (but not alcoholic) and fresh with aromas reminiscent of bourbon cask (but without vanilla). Long finish with creamy lemon yoghurt and pieces of wood. Bitter, sour and sweet at the same time. A real firework of aromas with dry sweetness. Lemon and bitter wood are what stays longest.